When Peter Molyneux, the "God of God games" turns one of his finest works into a Real Time Strategy title the results should be wonderful. So what went wrong with ‘PowerMonger’? I'm not afraid to commit hours to a game; I couldn't love RPGs if I did. Cumulatively I have spent over 350 hours playing games with 'Persona' in the title and my yearly romp through 'ChronoTrigger' typically will require a 30 hour investment. Alarm bells even ring if a Role Playing Game lasts less than 20 hours; these games demand a commitment. Over this lengthy play time a game should introduce new ideas slowly and not bombard you with too many play mechanics too soon. The best games start welcoming but end complicated when all the demanded actions are instinctive and second nature. I am not a fan of long introductory tutorials, I find them off putting. I don't want to have to spend ages reading a manual to know what to do when I press start. Worst of all I dislike games by designers too arrogant to think you might be alienated by their impenetrable game. This is why I am weary of 'PowerMonger'. Every 'Let's Play' I've seen on YouTube starts with bafflement; the player totally confused by what they should be doing. Archived reviews also strike fear into my heart. 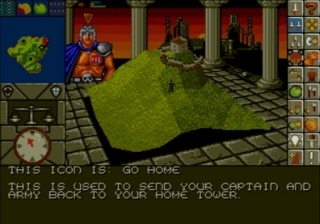 “It takes time to get used to the way this world works" suggested Amiga Format noting first experiences with the game are defined with "headaches and frustration". 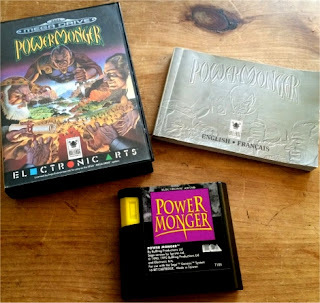 "Initially the game is rather confusing" Atari ST User Declared “‘PowerMonger’ doesn't have the same instant appeal of [similar games]". ST Action called it "complicated"; EGM called it a "very long daunting game". Game Pro even said you should "only look to ‘PowerMonger’ if you're in the mood for a long, slow pillage". This hardly seemed glowing endorsement for a game. Even ‘PowerMonger’s own creator the famous / infamous Peter Molyneux has said things that kill my enthusiasm. "[I have] an idea of the ideal game we want to write.’Populous' was the first step to writing this game, and ‘PowerMonger’ is further along that road. But our ideal game is yet to be written." Considering he went on to create 'Godus' which is presumably the intended destination on this development road, it's hard to muster enthusiasm to play an earlier stage in the creation process. While he has created sensational games like 'Syndicate', and 'Theme Park', Molyneux has also become known as a man who promises much but delivers little. He was even called a pathological liar by the cruellest of critics, in an interview that nearly prompted his retirement. In keeping with this reputation he didn't hold back when promoting ‘PowerMonger’ back in 1990. "‘PowerMonger’ is essentially a war game. But unlike the traditional board or computer games of that genre, we've created something that exists in real time, where you can do almost anything you want." Molyneux's earlier game 'Populous' sold over 4 million copies, creating an entirely new sub-genre in the process: the “god game.” ‘PowerMonger’ builds on some of the aspects of this game and In fact some magazine's incorrectly called it a sequel. It was something Amiga Power pointed out to Molyneux. "Well, yes," admits Peter, "while we were working on [‘PowerMonger’] I was constantly aware of 'Populous', and quite often went out of our way to make sure it didn't appear too similar. There were plenty of things we could have put in ‘PowerMonger’, but deliberately saved because they were earmarked for 'Populous II'." However when looked at critically, ‘PowerMonger’ lacks many of the traits we have come to expect from games where you play as a God. It is closer to Real Time strategy games, putting the player in the role of an army commander. It is the patriarch to resource-management, real-time strategy games. Players of 'Red Alert', 'Halo Wars' or even the earlier iterations of 'Warcraft' will have enjoyed 'PowerMonger’s' legacy. At the time Amiga Power even called it "the brave new face of war games." The excessively wordy and appropriately impenetrable manual sets up the story. "The kingdom of Miremer was destroyed by a devastating seismic upheaval. Collapsing mountains and fiery, poisonous ash spared few of your subjects and none of your lands. You have crossed ambivalent seas for countless weeks seeking a new home for your remaining handful of followers and a new realm for yourself. Finally, the fickle waves grew weary of toying with you and cast your frail craft onto the unfamiliar shores of a foreign land." "This land is rich and fertile, as you have dreamed it would be; but like all bountiful places, it is populated. Petty warlords and captains reign over the larger settlements and send their armies sweeping across the countryside. You could debase yourself into vassalage to these backward nobles and submit your followers to their misrule. But you were a king not so long ago, and you have borne enough indignity. It is they who will pay homage to you. You will gain a crown once again... or die in the attempt." This new world is divided into 195 sections and to complete the game you have to dominate enough regions to draw a line from the top-left corner to the bottom right. "As you venture across this new domain, you will have to win the fealty of those you encounter by words of diplomacy or dint of arms." The pompous manual notes. As a player you can choose to either slaughter the townspeople or be diplomatic, sparing their lives while capturing their land, food, and weaponry. A modern game made by the likes of Bioware would no doubt draw attention to the moral choices made; with the narrative distorting to match the players villainy or benevolence. In fact Molyneux even claimed that this was occurring in ‘PowerMonger’. "Initiating an action is not complicated but the result or consequences of that action may be" the designer claimed at the time. "For example, if you click on the Attack icon and then attack a sheep being herded by a shepherd, that won't necessarily be the only result. The shepherd, wanting to protect his sheep, may attack you, hold a grudge or even turn others against you. The game may react to your simple instructions in a complex way." I didn't find the response to cruelty this subtle but did find that pacifism lead to an easier game, if only because it's impossible to recruit soldiers if they have all been massacred. "I've always loved giving people the opportunity to be unspeakably cruel and vicious," Molyneux says. 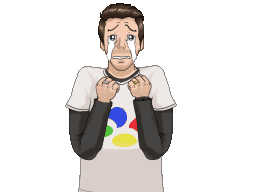 "I don't know where this comes from, but I like being cruel to digital characters." For each new settlement you have the choice of how ruthless you wish to be. If you passively approach you can recruit 25% of populace and leave the town relatively peacefully. This means they will continue to gather resources which can be accumulated at a later date. A neutral approach recruits half of the citizens while aggression may significantly expand your army but it will leave no one left to build resources. As with so many RTS games the best approach to ‘PowerMonger’ is a balanced one. You need to be mindful of your army's current and future needs. Expand too quickly and you will not be able to feed your army, but too small a force will not allow you to successfully take new territories. According to the developers a player "must learn to balance force with restraint, and the requirements of the day with the needs of days to come. Only then shall you be the ultimate Power Monger". This all sounds excessively complicated and the plethora of onscreen icons are certainly daunting but the reality is ‘PowerMonger’ is a monotonous game that consists of micro management. Most of the game focuses on either attacking towns, inventing tools, crafting weapons, acquiring food or sourcing items from the towns you capture. Molyneux may boast that a huge number of variables effect victory in battle but I found I always won if I had more men on my side of the battlefield. If your men aren't sufficiently armed all you need do is find an occupied supportive town with a workshop; they'll invent something useful which automatically gets distributed to your troops. In a way the game feels more like a sports management sim, because in battle there's practically nothing for the player to do. As Electronic Gaming Monthly once noted "Action fans will probably shun this one, but students of armed combat involving troop movements, armaments and other motions will probably love it." At the time much was made of the living world that exists without player interaction. Each citizen has their own name, behaviour and routines. They age, have children and can die even without the player coming into contact with them. "You can have up to 2000 individual personalities operating in the same game" boasts Molyneux. "That's the limit for these machines, I think." 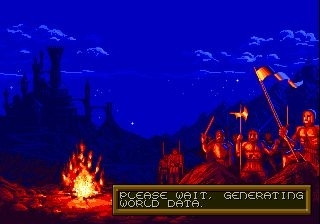 Reviewers would talk of testing this by leaving the game overnight; coming back to a computer only to see that there had been a population boom or a society that had consumed itself. Its detail that's not needed though. A player would have to have a great deal of time on their hands to click on each person to determine their heritage and back-story. It may rain and snow but while they do technically impact the action by slowing down your army as there's no way to control the weather you literally soldier on regardless. So many little details and elements of 'PowerMonger' are so easy to miss you may be left wondering why Molyneux even included them in the game. At the EGX Expo in 2012, Molyneux talked about his earlier games. He acknowledges that an obsession with creating a living authentic world ruined ‘PowerMonger’. "I did one insane thing as a designer, I thought about realism [...] I thought to myself "there's this little country here and you can send your armies around but how do they get their orders? They don't have any telephone or radio it's supposed to be set in ancient times. I know, I'll send them orders by carrier pigeon!"" Evidently this decision was reached a week before the game was supposed to be finished. "When you clicked on the map the carrier pigeon took five minutes to fly out to give orders. What a disaster! If I'd just realised that that's nowhere near as much fun as click[ing] and your army going, that would have been a far better game". Of course when Molyneux says "clicking" he is referring to a player using a mouse, but on the console ports a player only had a control pad. This made the whole game ridiculously aggravating as moving a pointer to moving targets is infinitely harder with a d-pad. On the home computer versions you could interrupt an opposition's carrier pigeon by clicking on it, but I can't tell you if this was a feature on the Mega Drive as clicking on a two pixel wide flying bird is impossible. Most of the Mega Drive's screen is taken up with things that mask how small the play space is. The huge text window and columns of excessively complicated icons waste too much of the screen. 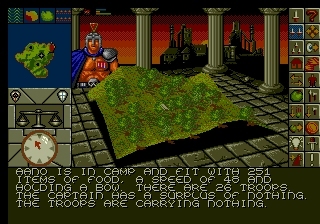 That being said 'PowerMonger's 3D polygon based game map wowed critics at the time. "The graphics are simply amazing" claimed CVG magazine. "Watching your men cart a newly invented boat to a river, climb in to it and paddle across is just one effect that'll blow your mind!" It is only possible on the Mega Drive by limiting rotation to 90 degrees and by presenting the people, trees and other game objects as flat 2D sprites that exist in a virtual 3D world. It's certainly impressive for its time, hardly surprising given how important Molyneux considers graphic designers to games. He believes "they have at least as much say in the look and feel of [a game] as the programmers, but they're hardly ever covered in magazines". ‘PowerMonger’ is a game that should simply have been streamlined. Far too much is possible, with many commands being pointless. No one needs an option to send an army home when you have spent hours getting them into the right position. There’s also an option to take a captain and have him spy on an enemy army. While it can produce some useful information if he gets caught, they’ll kill him, which puts you at such a disadvantage it's not worth the risk. Much like the carrier pigeon nonsense it's worth commending Molyneux for trying to add realism but ultimately it's detrimental to enjoyment. As The Sega 16 website said " it’s just strapping a beak and wings to what in any other game would be annoying input lag". Prior to the car crash that was 'Godus', (a game that Molyneux claims destroyed his reputation) ‘PowerMonger’ was labelled the "low point" in the designer's career. "The game became absolutely crap" he once said to Polygon. "The control interfaces for ‘PowerMonger’ were far too intricate to master". Sensible Software's 'Mega Lo Mania' is a similar game released at a similar time. Admittedly this game is also hard to get into, but once you've grasped the concepts the game just keeps getting better and better. The continually evolving weapons and environments keep the game varied and the iconic Sensible Software humour prevents the game from getting lost in its own grandeur. Extended play of ‘PowerMonger’ however is the opposite. The further into the game you get the more you realise that despite the game seemingly initially complicated you'll quickly find every new map demands exactly the same actions. So it turns out that there is something worse than an unnecessarily complicated game; a game that isn't worth the time it takes to understand. After a dozen hours spent cross referencing the weighty manual and determining which commands are actually worth issuing I now understand how to play ‘PowerMonger’. The problem is, after all this study time I don't actually enjoy playing it. Growing up I had an Amiga and was led to believe that ‘PowerMonger’ was good. Sadly it took spending £8 at my local game shop to find out that I was wrong. Thanks for the great price Level Up Games Canterbury, but it's a shame you didn't encourage me to buy a better game! Alex from Level Up here! In our defense you had asked for 'classics' and this is certainly that! Come and trade it back in?